This summer stay safe in your pool with our 10 quick pool safety tips. Having a swimming pool can be an enormous source of pleasure. Many families spend hours of fun playing, lazing and entertaining poolside. However, a swimming pool is also a big responsibility. The 2nd most common cause of death through injury for children under 14 is drowning. Many of these happen in family backyard pools. Don’t take water safety for granted. Take the best care of your family by making sure your pool safety is high priority. Always supervise your kids in the pool. Don’t expect older children to supervise younger children. 64% of Drownings recorded in 2018 had no supervision with some cases supervision was only absent for 3-5 minutes!Remember to take turns in being the ‘supervisor’. Commercial swimming pools rotate lifesavers every 15 minutes to ensure they stay alert . Ensure everyone present can swim including adults. Young children can learn to push off the bottom and to always head to the edge of the pool. They can learn to grab a rope or other device thrown to them. Most baby swimming classes focus on these types of activities to promote water safety as well as confidence. 4. Teach SAFE PLAY around the pool. Don’t allow diving (unless your pool is deep enough, and only then when clear), running around the pool, dunking or bombing others. Whilst many of these activities seem great fun, they are too dangerous around the swimming pool.Teach children to check pool depths & temperatures before getting in is also an important part of water safety. 5. Keep your pool area TIDY. At the end of the day, store toys, floaties etc away from the pool and out of reach of children so they are not tempted. Ensure chairs, tables etc are not a ‘climbable’ object near the pool fence. 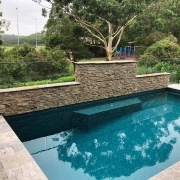 Maintain a 900mm clear zone around the pool fence. Have the CPR sign easily visible in the pool area (regulation). Learn CPR. Have a family CPR lesson. There are providers who will visit your home and teach the whole family. Some pool companies will offer this as a bonus with a new pool. Take up the offer if you have one. You never know when it might be handy, not just at the swimming pool. Many pool chemicals are potentially dangerous and/or corrosive. Always store pool cleaning chemicals out of reach of little curious hands. Protect yourself by always using protective equipment when handling such materials. Err on the side of caution and be a good role model to your children. Swimming pools generally mean lots of sun time which is great for your vitamin D levels. But always use a good quality high UPF sunscreen to prevent skin damage. Limit exposure in the middle of the day. Take a nap inside instead. Along with sun burn, heat exhaustion is another common symptom of too much sun. Have plenty of fresh cool water available for swimmers and encourage regular drink breaks. Absolutely NO GLASS in the pool area. This includes beer and wine bottles. Invest in some plastic wine glasses, and buy beer in cans for the pool area. Trust me, getting glass out of your pool is an expensive and difficult exercise requiring you to drain your pool & vacuum it thoroughly before refilling. (And don’t drink and swim). If you want to use your pool in the evenings ensure adequate lighting. Most pools built today have internal lights. Install some garden lighting and make your pool area paradise. Just don’t swim in the dark. So stay cool and stay safe with these pool safety tips to help you enjoy your swimming pool. If you need any assistance ensuring your pool fence or pool gate is compliant, get in touch with Steve today.